In the News (from Psychologies.ru): “Our life flows and passes losing its shades and becoming black and white, friends and foes, heroes and villains. Psychologists call this perspective cognitive simplicity. “This phenomenon appears at infancy. We all know that we acquire the complexity of this world with time through our relationships with people. “It is better for our leaders if people perceive the world as a simple place since it is simply easier to manage them and to control them. Many agree and are willing to accept the rules of this game. “Simplicity as a form of psychological protection helps them cope with the complexity of the world. A simple perception of the world allows a person not only to see the goal more clearly but also to attain it. “Cognitive simplicity is the basis for manipulation that comes down to people’s ability to attain the goals we were given, while convincing others to also want that. These manipulations are based on ideas that have to be subordinately in common with those who resemble them. The manipulations refer to actions against cooperation trust and autonomy. My Comment: I believe that only an addition to the egoism that manages us on its own, the second force of nature, the positive force of connection and love will make our world and man living in it balanced by the two forces. We will be able to manage ourselves and the world and to build a balanced system of the world. If not, we will fall into increasingly greater egoism that leads us to terrible sufferings, and eventually after world wars and annihilations we will still acknowledge the need to complement ourselves with the positive force of life and to build humanity as a balanced system. The positive force of connection can only be discovered in the process of workshops and discussion circles that are based on the wisdom of Kabbalah and the wisdom of connection. The weekly portion, “BeHukotai,” talks about the entire world being reciprocally linked and that the system of creation was determined strictly and precisely. We are found within it, and its influence on every person depends upon his deeds and whether or not he accepts the laws of this spiritual universe upon himself. The spiritual universe is not just what we see around us. Rather, it includes all of the forces and systems that are hidden from us, with only a fraction of them being revealed. If we become familiar with its laws and maintain them, then everything will be all right. If not, it will begin to whip us through blows. The system is arranged and constructed such that it takes into account the same object upon which it acts and influences. We partially see this in our world. For example, the system relates to a small child more mercifully and gently than to a mature person, enveloping the infant with concern. He falls, and this is not so bad, whereas, if an elderly person falls, he is liable to break his bones. In other words, the system is arranged and constructed such that it relates to each one of us uniquely, according to the level of the person, his destiny, his fate, and who and what he is. Question: In other words, if the person thinks that the system has given extraordinary suffering to him, does it only seem that way to him, whereas the system, in fact, gradually gives him what he can endure in stages? It could be that he also cannot endure it, but everything has been considered absolutely precisely, according to his fate, his purpose, and the same conditions in which he is found. Everything is accommodated to the same goal that all of us must attain. Essentially, everything is very simple because there is a beginning and an end, and from beginning to end, everything has been considered in each stage in relation to everyone. On every level, a particular freedom of choice is given to us and we operate within these precisely defined frameworks. All of us exist and are connected within a single system that manages us. There are those who feel this and those who don’t feel it, those who already have discovered its laws for themselves and have attained some kind of levels, and those who are only beginning or have not even begun to understand the goal of creation. Question: I have made great efforts to overcome the problems of connection in the group and thought I had succeeded. But then I discovered that all the problems had only become more subtle and more difficult to detect. Aren’t I supposed to get use to this type of work with time? Answer: A person is new at any given moment and so every moment he discovers that his foundations (our forefathers) engaged in idol worship. This is where he begins the new level. He discovers that he is in his egoism, in the desire to receive. He hates everyone and cannot bring himself to true bestowal. He is already able to somehow bestow in order to receive but not to bestow in order to bestow. It is from this uncorrected state that he begins to work. He has to organize the right support in order to get closer to the true form of bestowal called faith, above his personal accounts. He has to find out whether this is possible. We can perform different actions in the group and awaken the Surrounding Light that performs the action. There are actions that don’t draw the Surrounding Light unto us, on the contrary, they have no illumination from above. Therefore, performing them in a big group will not lead to any results. There are actions we perform in the group and thus draw the Surrounding Light, which is the Light that has to be revealed in the corrected vessel. The vessel is not corrected yet, but it is focused on correction, which means it tries, makes an effort, sweats, and is in the process, exerting itself. In response to such efforts, the Light operates, and this is what everything is based on. A habit is a special angel, a special force that was deliberately introduced in our system. Because, in fact, a habit doesn’t really exist. It is like an electric system that receives no energy, and thus immediately stops working. You cannot be upset that electricity ran through it before and now it doesn’t. We have to start anew each time, and therefore, there can be no habit, since every state has a force, its own angel. We have overcome this once and it is recorded in us. This system already exists and operates, but an even more corrupt system is revealed in it and we have to take care of it. In fact, it is the same system but through higher resolution that allows us to see things more deeply. I don’t fight myself anymore in order to get up in the morning and to go to the lesson. I have been doing that for years. But then new obstacles appear and there is a greater hardening of the heart, and suddenly I begin to fall asleep during the lesson, which I didn’t do before. We are constantly ascending the levels of complexity. But there are no habits; every moment my relation with the Creator is totally new, the conditions change. We have to discover that “There is none else besides Him” in every condition and go on accordingly, which means that we have to reach adhesion: very short and accurate actions. In the corporeal world these actions include the whole world, which we have to connect to us, but it is actually only several actions. The more we advance, the clearer these actions become. Instead of “Holy and Blessed” (Kadosh Baruch Hu), the Creator, the holy names of ten (ADNI, HaVaYaH Elokim, etc.) there is the force of bestowal, the force of faith, very simple concepts: GAR of Bina, ZAT of Bina. We have to try to bring everything to the most concise definitions. In the News (Russian-Bazaar): “In another few decades, a quarter of the children will be born with ASD (Autism Spectrum Disorder). In addition, boys suffer from this disorder five times more than girls (4 out of 20). It is impossible to detect autism in the fetal stage of development or in the newborn. Phenomenal memory is nothing other than a result of autism. “Many claim that autistics are much more talented and intelligent than regular children. But those that suffer from ASD are absolutely unprepared for independent living. They require constant care and supervision. The autistic can be used in scientific and technical fields, in mathematics and programming. “They can prove themselves excellently in plants and factories, in hospitals and in laboratories. Military experts commend the skills of the autistic. These people can carry out any task if this task is defined precisely and correctly. My Comment: All the “new” problems are cured only through mutual relationships in society because they are the result of a lag in the correction of society. In the past, all of humanity lived together in ancient Babylon, just in this world. But then a small group came out of Babylon and began to advance toward the Creator before everyone else. This group is called “Israel” because it yearns for the Creator, Yashar-El (straight to the Creator). They attained the spiritual level and then fell from it. They went down to Egypt and came out of there, built the first and second Temples, which were destroyed, and eventually returned to this world and mixed with all of humanity. Now, we all must exit this world together. First, the group of Israel exits the way it is, having undergone the shattering and the mutual incorporation in the entire world. Now, it is also called Israel, Yashar-El, and those who feel a yearning for the Creator are attracted to it. Just like Abraham led everyone who followed him out of Babylon, now, too, anyone who wants to advance toward correction exits this world. After all, we have reached complete mutual incorporation. We are in the same state that Israel once was, and we need to tie ourselves to the entire world, on the one hand, which we do through dissemination, and, on the other hand, connect to the Creator. This is our role. We work with the entire world on the corporal level by disseminating the wisdom of connection in which we have a lot of experience, but working with the Creator is more problematic since we don’t understand, don’t feel, and don’t know how to do it. 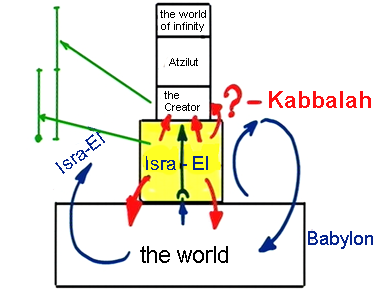 We are in a very delicate position when it comes to that, and so Kabbalists tell us how to establish our connection with the Creator. This is what the wisdom of Kabbalah is all about. Our role is to connect the Creator to Malchut, to the desire to receive, as its carriers. We each carry parts of Malchut, but one part cannot connect with the Light, with the Creator. There must be ten Sefirot in Malchut, and it should be dressed in ZA, which is the Creator. It must attain at least the level of its Chazeh (chest). Thus, Malchut becomes a point, and this point begins to connect with ZA. Otherwise, there is no connection between Malchut and ZA, and without us it simply doesn’t exist and is in a shattered state, which means in our form as its fragments.